The London IWW branch will be holding a celebration of the life of Peter Ridpath on Sunday 1st July 6:30pm-9pm at the MayDay Rooms, 88 Fleet Street, London EC4Y 1DH. Peter was a central figure in the London Branch of the IWW. 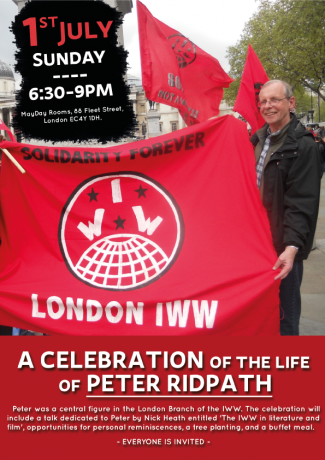 The celebration will include a talk dedicated to Peter by Nick Heath entitled ‘The IWW in literature and film’, opportunities for personal reminiscences, a tree planting, and a buffet meal.